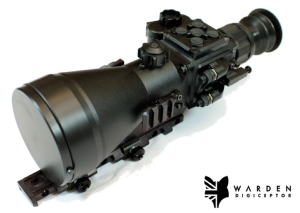 The Warden Digiceptor rifle scope provides day / night capability with zero compromise in it's night time performance. The wide field of view from the fast objective lens and high sensitivity 1/2" sensor combines with a best in class 1024x768 OLED display to give 8x optical magnification. 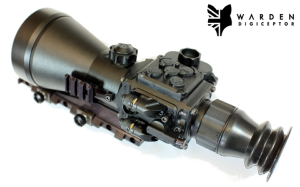 For the user this means enough magnification for shooting at extended ranges (400m+) and a wide field of view for easy scanning and tracking targets. The body is all CNC machined from aluminium to maximise rigidity, robustness and zero retention. The standard mounting system supplied is adaptable to fit most rifles with standard Picatinny rails without any eye relief problems. Special extended rails or mounts are not required for the Digiceptor. An interface to fit MAK mounts is also available as an option for rifles with that mounting interface. The mounting system is also adjustable for windage to enable perfect bore sighting and a central reticule. Laser range finder (LRF700) compatibility (can be ordered as a package via the drop down at the top of the page). 5 memory profiles for scope setup, reticule and zero so you can have profiles for different rifles, ranges or ammunition types. Cant meter to ensure rifle is perfectly level for long range shooting. 5 types of reticule also selectable black or white. 2 x Picatinny mounts for fitting accessories such as LRF700 and IR illuminators. For use in complete darkness an IR illuminator and suitable mount is required. For shooting to 400m+ the Black Sun Dark Engine is an excellent lightweight option. 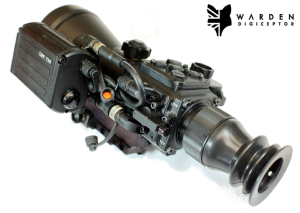 The Warden Digiceptor is supplied complete with rifle scope, Picatinny mount interface, video / power cable, user manual, soft carry case and 2 year warranty. A bit of a lump, but robust and easy to use. Nice small ret for pin point accuracy.